A few weeks ago, I finally met, in person for the first time, a friend whom I initially met over Flickr years ago. I really admire his photographs (especially this one taken at Columbia and ones of his adventures dining out). As Andrew also shares a keen interest in food/restaurants/dining out/etc., we had been trying to figure out the best time and place to meet up over the past couple months, and after much deliberation, we decided on checking out one of his suggestions, i.e., Traif in Williamsburg, one day after work. I had no idea the meaning behind the restaurant's moniker until Andrew mentioned it (followed by by some Wikipedia-ing, haha). Treif is the Yiddish word for "food that does not confirm with the Jewish dietary laws of kashrut" (i.e., how to keep kosher). It is derived from trēfáh (טְרֵפָה), which is Hebrew for "torn" -- a stark contrast from kashér (כָּשֵׁר), which means "fit" in Hebrew. Originally, treif designated one category of non-kosher meat, i.e., meat from an animal or fowl that has been "ravaged in the field" that keeps with the prohibition in Exodus 22:30 and unfit for consumption; today, however, the term now applies to all products that are non-kosher. 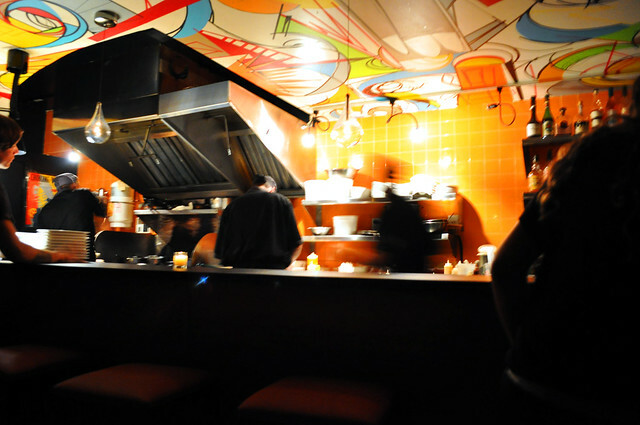 The open kitchen and accompanying counter at Traif run by Chef Jason Marcus. 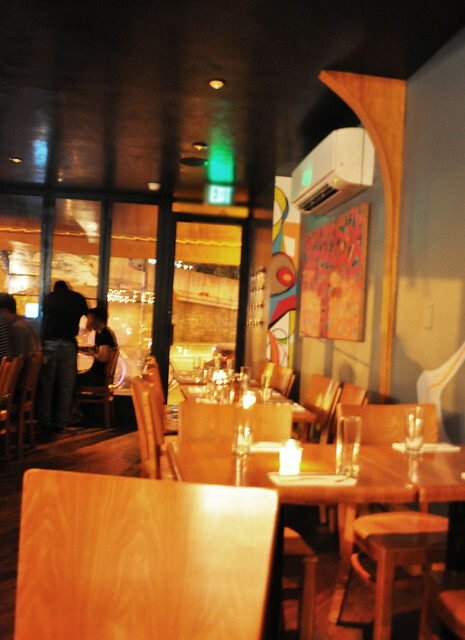 Inside the restaurant's intimate space. Along with the main dining area that surrounds the open kitchen (seen above), there is a garden room at the back of the restaurant looking out onto a backyard landscape. 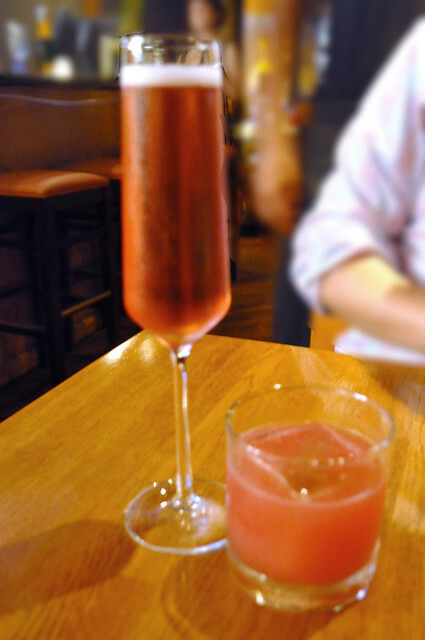 To begin our dinner of small plates, I had a non-vintage cava rosé produced by Casteller from Spain, while Andrew selected a cocktail from the beverage list. The cava rosé was crisp and had the ideal level of dryness with a hint of strawberries on the palate. 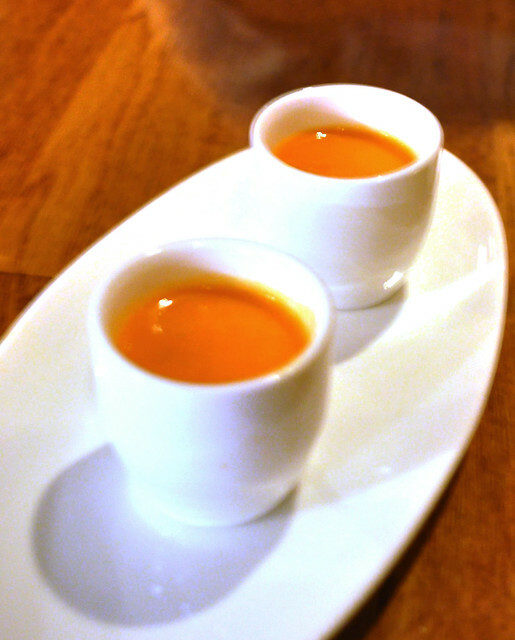 The kitchen started us out with a tomato gazpacho which had a great smoky thickness to it. For someone who really doesn't believe in chilled soups, this might very well be one that works for me. The menu at Traif is comprised of a series of "plates to be shared" in varying sizes and richness. As you work down the menu, the plates increase in size (ranging from small bites to entrée-sized portions) as well as "savoriness" (i.e., heavier, richer course compositions). To start, we decided to try Joe's chopped chicken livers with balsamic-bacon toasts, rosemary, and shallots, the bacon being traif. The chopped chicken livers were served paté-style for spreading over the balsamic-bacon toasts. Chicken livers are usually too gamy for my liking, but the execution here worked really nicely with the crostini slices, as the richness of the chopped chicken livers were balanced out with the vinegary balsamic drizzle. The sprinkling of bacon and essence of rosemary also acted as interesting flavor enhancers. This was the perfect dish to start with, especially with what the menu had in store for the rest of our meal. 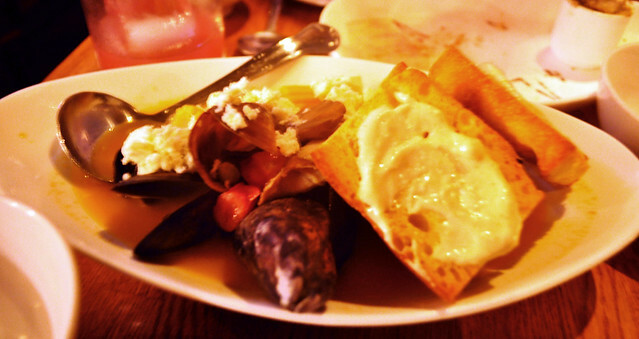 Next, we tried the icy blue mussels with a sriracha broth, feta, and tomatoes (shellfish being traif). The mussels were plump, and the broth gave them an intense kick (I mean, what else would you expect with something infused with sriracha sauce? :P). The sliced baguettes on the side were spread with some kind of herb-infused whipped butter, which was perfect for soaking up the fiery broth. Before the remaining small plates we had ordered, Andrew and I both had a glass of the 2010 sylvaner produced by Gysler from Rheinhessen, Germany. It was absolutely delicious, having the aspects in between a riesling and a gerwitzminer with moderate sweetness and a rounded crispness to it. Luckily for us, it went really well with all of the dishes that followed. 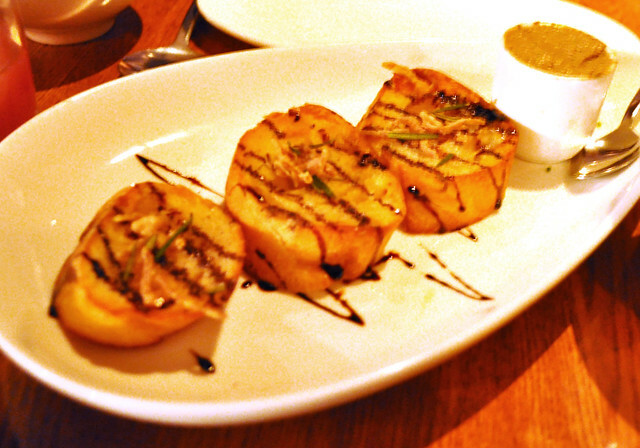 Moving toward the more savory dishes included the dayboat scallops (sorry for the blurriness!) with a sweet corn risotto and herb butter (scallops here are traif). The scallops were cooked to the ideal temperature (no raw sliminess or overdoneness to the likeness of a pencil's eraser) -- something that I've found to be hard to execute in restaurants -- with their exteriors seared to a super browned crisp while the inside is bleeding with heat and flavor. If you're ever on the fence about ordering scallops because you fear them being overdone, fear not at Traif. They were very delectable! 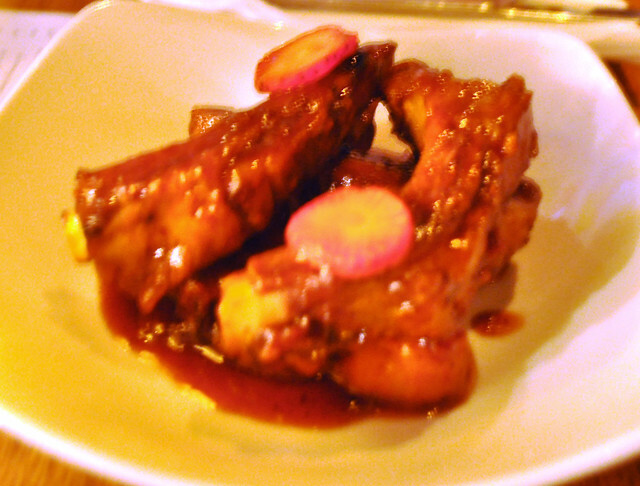 We also tried the strawberry-cinnamon glazed baby back pork ribs (with pork obviously being traif). The glaze was on the sweeter side (sweeter than honey barbecue, in case you were wondering), playing well into the tender meat that was nearly falling off the rib bones with each bite. Skip the hassle and just go with eating them with your bare hands -- throw any attempt at etiquette you might have with these because you'll end up doing just that. 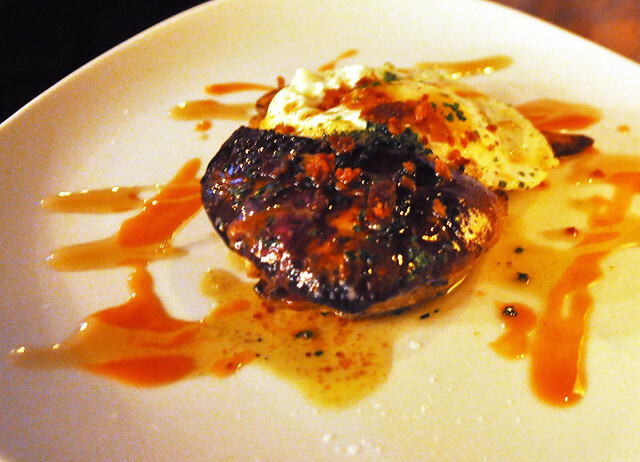 We were curious about the seared foie gras with fingerlings, ham chips, sunny egg, maple, and hot sauce (the ham chips being traif) -- very similar to the breakfast-style foie gras I had at Matyson in Philly. It brings a whole meaning to "gourmet breakfast" as the fatty, rich lobe of foie gras melted right into the slices of fingerlings as it all swept up the runny yolks and fried whites. The flavor that threw this into a "morning" context? The maple sauce, for sure. Man, what I'd give to physically and literally have this every single morning! :P Certainly can't come to Traif without ordering this! The usual caveats that come with ordering sweetbreads is that many times, no matter how dressed up they are, they end up bland, flavorless, and rubbery once they arrive at the table. And even given these occupational hazards as an eater (major #firstworldproblem right here), I can never help myself -- if there are sweetbreads on a menu (as there happened to be at Traif), chances are I will risk a potentially mediocre dish and order it anyway. I never want to miss an opportunity for some well-executed sweetbreads, so this is my M. O. However, there is that glimmering silverlining every once in a while, when a restaurant really nails them with some culinary dexterity, astounding you with these euphemistically-named glands. I can happily report that Traif is a spot with that very silverlining. 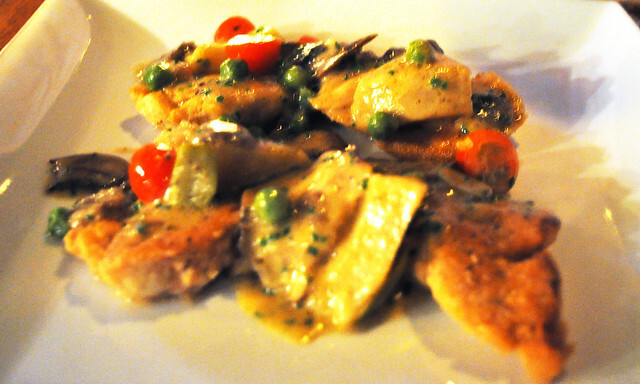 Quite possibly my favorite course of the evening were the sautéed veal sweetbreads with peas, tomatoes, artichokes, and shiitake mushrooms (still trying to figure out what's traif here, as sweetbreads can be deemed kosher!). Prepared in a stew-like fashion, with a crisp yet soft exterior (almost like breaded chicken cutlet, only more tender), the sweetbreads were super savory and melty on the palate, arguably still as piping hot as it was on the pan. The earthiness of the accompanying vegetables tamed down the richness from the sweetbreads, and the resulting gravy gave it some more flavor and textural contrast. So if there's one "adventurous" thing you'd want to order here, this would be it! 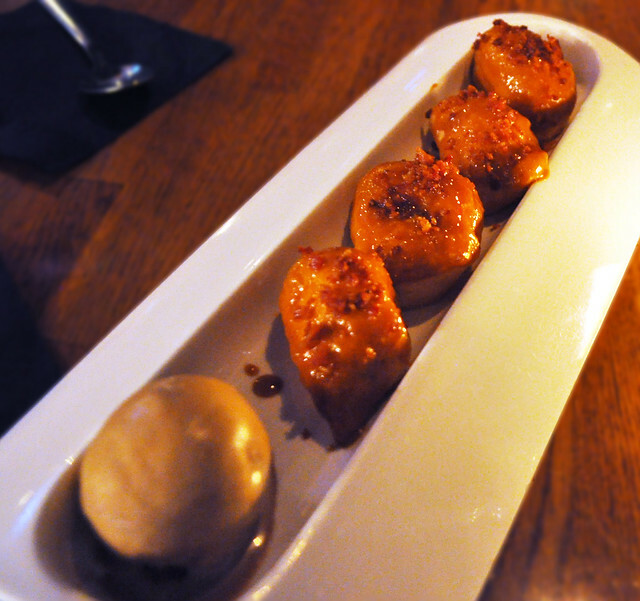 For dessert, we couldn't forego the restaurant's signature bacon doughnuts with dulce de leche and coffee ice cream (a double-whammy of traif). In all honesty, I found them a little disappointing -- the dough didn't really have much to it, and the dulce de leche was on the super sweet side. Overall, these were bit of a letdown, but I'd be curious to see how the other desserts play out. Findings: All in all, my experience at Traif was very noteworthy. Everything, down to the wine but excluding dessert, exceeded my expectations, leaving me with a palate with all of its senses tickled intensely. Each dish had a distinct vignette, contributing something different from each other. And just as I've mentioned in a few of my posts already, I am a total sucker for clever restaurant monikers, especially if it's the mot juste and the execution of cuisine only supports this further. If there were things I would say you shouldn't miss, it'd be chopped chicken livers and the sweetbreads -- unbelievable! 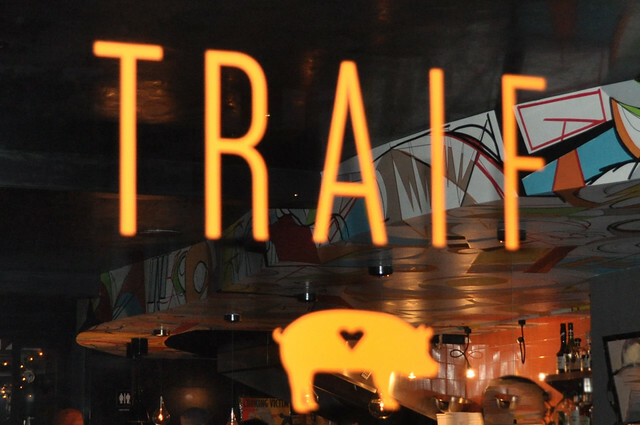 Williamsburg is filled with so many hidden gems, and I am anxious to share that Traif is undoubtedly one of them. So if you're looking for a restaurant where you can indulge guiltlessly in your love for all things porcine and shellfish, you will have come to the right place. Price point: $8-18 for each small plate, $9-11 for each glass of wine, $7 for dessert. 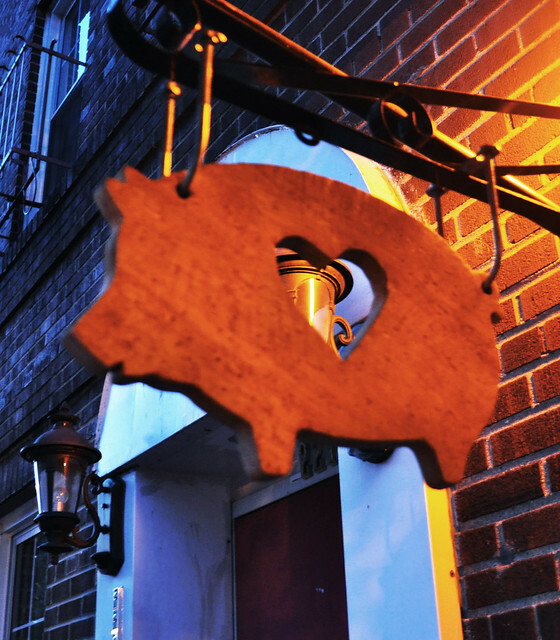 For the love of all things porcine and shellfish (among globally inspired soul food), you will find much to delight in here with its small plates bursting with unique flavors and combinations.